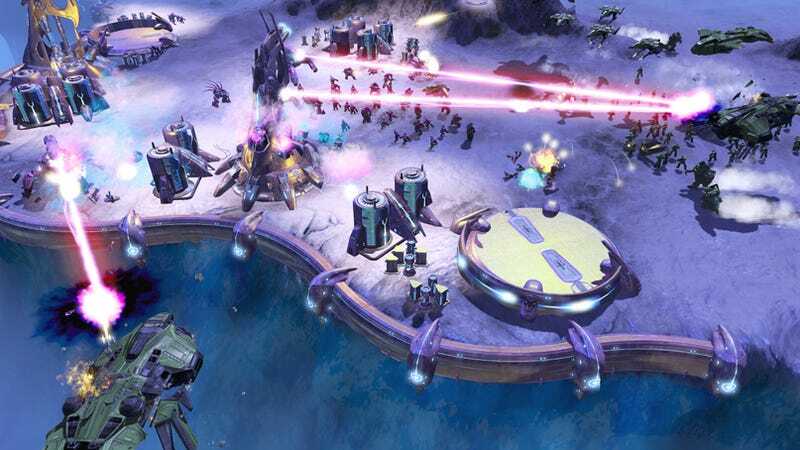 Ensemble Studios' real-time strategy take on the Halo universe is heading to the printer, with a single player demo of Halo Wars ready to strike Xbox Live Marketplace on February 5th. The Halo Wars gold master is on its way to manufacturing, well in time for its late February / early March release dates. While excited fans of the Halo series dream of discs sliding out of a giant, magical disc pressing machine, Microsoft is readying a playable demo of the game to help ease the wait. On February 5th the Halo Wars demo will be available for download, featuring the first two levels of the single player campaign along with "Chasms", one of fourteen multiplayer maps shipping with the full game. Note that the multiplayer map looks to be only playable against the A.I. is Skirmish mode, so you'll have to wait for the full game in order to hop online. Along with the news of the demo, Microsoft Game Studios also launches a new video documentary for the game today, with the first episode now available for download via Xbox Live.